This isn't really an electric mandolin album; all the mandolin work here is done on vintage Gibson acoustics, although Julin sometimes does plug in when he plays live. But what the heck, it's a great disc, and I told him I would review it. Along with Ron Getz on nylon-string guitar, Julin forges an interesting hybrid of jazz styles on Mr. Natural. In terms of the instrumentation—with two acoustic string instruments trading leads—there's a definite nod to the string-band "gypsy swing" of Django Reinhardt. On the other hand—in terms of the actual notes being played—neither Getz nor Julin is really a Reinhardt-style player, and the rhythm section (Dave Wall on drums and either Glenn Wolff or Dave Hay on bass, depending on the cut) deliver the walking lines and brush work you'd be likely to hear in a conventional piano-and-horn combo. Mr. Natural sports a pair of ethereal ear-candy bookends—an improvised piece called "Drone" and a quiet take on Horace Silver's "Peace"—that shimmer, but fall a little short of memorable, at least for me. But in between there's a lot of well-chosen, brilliantly executed material. On Antonio Carlos Jobim's "Triste," both Getz and Julin display exceptional fluidity. Julin's remarkable smoothness and roundness of tone are immediately noticeable. This ain't your stereotypical mandolin sound: it's not the least bit shrill and there are loads of low end. You could almost mistake it for a steel-string guitar, except for the occasional break into a beautifully controlled tremolo. For "Days of Wine and Roses" Julin provides subtle, tasteful brush-stroked chordal accompaniment as well as a nice, tight, rhythmically precise lead break. Julin and Getz get equal billing and equal time on this recording, which is as it should be—they're equally talented. On "Secret Love," Getz throws down the gauntlet with a masterfully crafted solo—his best on the disc; Julin's response is initially subdued but soon reaches the boiling point. The title track, a Julin original, finds him effectively using pulloffs and hammer-ons on a funky, finger-twisting, infectious theme that goes a lot of unexpected places. He even throws in a bit of tremoloed chord soloing. While this ensemble is clearly at home with jazz standards, they don't hesitate to look elsewhere for material. There's a sensitive take on Eric Clapton's "Tears in Heaven," as well as a genteel version of "South Carolina Blues" that features Delta-style playing from Getz and a bit of crosspicking from Julin. And is it me, or does Julin sneak in a quote from "Stairway to Heaven" at the end of "Black Orpheus"? Julin, who makes his home in Traverse City, Michigan, also plays a 5-string Blue Star Mandoblaster in a band called Jazz Tractor, and he sent along a four-tune live demo disc titled, appropriately, Psychedelic Freak-Out Jazz. Here he cranks up the delay and wah-wah pedals and lets 'er rip, accompanied by some high-flying 7-string electric bass from Jason Kott. To back up the licks these two maniacs play, drummer Chuck Navyac wisely keeps it simple and stays pretty much out of the way. Look for more news about this recording shortly. 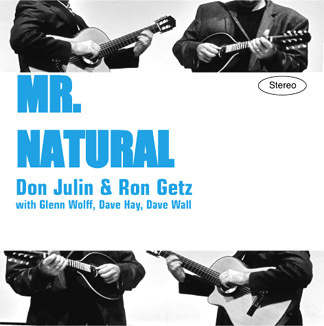 You can order Mr. Natural and other Don Julin recordings from Julin's Web site.